I baked these dee-lish Gluten-Free Raspberry Scones the other day after seeing them on Mae's blog and asking her if she could share the recipe. I was a little hesitant at first to try them out, as previous experiences with gluten-free foods have left much to be desired. But I trust Mae's tastes (no pun intended!) and went ahead and baked these bad boys up. And WOW! Am I ever happy that I did! These so beyond delicious that I ate 2 in a row (they were, after all, straight from the oven and oh so fresh and warm! ), and the Munchkin LOVED them as well! He kept tugging on my sleeve to give him another bite and when there was no more scone left on my plate he was yanking on my hand to drag me to the kitchen table where the rest of the scones were cooling! I pretty much call these scones "guilt-free baking" since not only are they gluten-free, but they are dairy- and egg-free as well! Besides being vegan to boot, they seriously took only 5 minutes to whip up (that's not including baking time!). I'll definitely be baking these a lot. I'm already thinking of what other fruits I would like to try in this recipe! Brett and I already try to buy organic and local as much as possible, and we're currently thinking we should look into local farms so that we can buy properly raised chicken meat. Since watching Food Inc I've been really conscious of everything going into my body, not just for my own personal health, but because I'm also a breastfeeding mother. Having a kid has really put a lot of things in a different perspective, and has got me thinking a lot. So much so that I think I need to make a new 101 goals list! Hmmm...what's everyone been eating lately? The hubby and I are doing P90X so I've really been trying to cut out all the sweets... but Easter has not been so easy. Corey and I are trying to change the way we eat too. We are just trying to be generally more healthy and active. Corey joined the gym and we are going to start going running as well. We want to run the 10k this year so we need to get fit. Those scones look amazing! 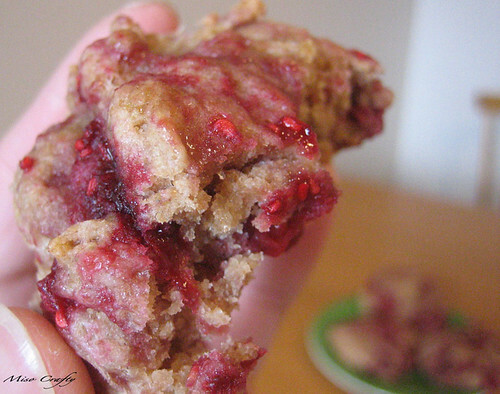 I need to try some raspberry scones....maybe this weekend! This is the time of year to clean up a diet, the produce just gets better and better! I completely and totally applaud you for doing such a demanding program! I don't think I have even half the willpower that you have to do it! Bravo! I'm hoping that with the coming of summer and warmer weather that I'll get back to being active too. Good luck with the 10k! When the little one is a bit older I would love to do a marathon!